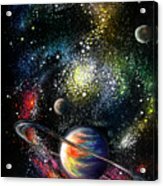 Endless Beauty Of The Universe by Sofia Metal Queen - 7.000" x 10.000"
Endless Beauty Of The Universe framed print by Sofia Metal Queen. Bring your print to life with hundreds of different frame and mat combinations. Our framed prints are assembled, packaged, and shipped by our expert framing staff and delivered "ready to hang" with pre-attached hanging wire, mounting hooks, and nails. There are no comments for Endless Beauty Of The Universe. Click here to post the first comment. With this painting, I won 2 art shows (real, not online) and was "Best Space Artist of year 1993" in my hometown where lived more than million people.